My kids are interested in learning to program. Maybe it's because their dad already does that, or maybe it's because they want to create a My Little Pony game, or a Skylanders game of their own. Either way, there are a lot of resources available to children nowadays to learn this wonderful skill. I took a look at The Foos, by CodeSpark.org, having read about their efforts some time ago. I was pleased to realize that this first game of theirs is out already, so both I and my 7-year-old son took a look at it. First off, it's fun and has a light-hearted personality, appealing to boys and girls alike. There are no detailed instructions, relying instead on as-you-go tutorial learning. That is, it tells you which piece to use and when, for the first time you need to use any particular piece. On each level you are to collect the star, and as many coins as you can, for a good score. Occasionally there's a silly-looking miscreant type of character opposing your progress somehow, and sometimes your mission is to capture the little guy. The game teaches logic, patterns, and situation assessment. There's almost never a need to hurry through any particular level, although on occasion there is merit to finish quickly. You play by choosing a series of actions available to your character, and then allowing him or her to play through those actions all at once. In this aspect, it reminds me a bit of a boardgame by Wizards of the Coast called RoboRally, or the more-recent clone of that one called Robot Turtles (which raised kazoodles of funding on Kickstarter). Of the board games, I prefer RoboRally, but it IS more complex than the Turtles. I digress. The Foos is very lenient in how you're allowed to solve each level. You can program and reprogram your character's actions as many times as you want, and it only affects the rating you receive for finishing. On the downside, the Foos is remarkably short. There's a sort-of subtitle associated with the game where they call it the "hour of code" and for kids that's probably about right. For adults it would take a lot less time than that to finish - I did it in about 15 minutes, I think! Once you're finished with the missions provided, there is a sandbox area that you can play in. The sandbox was actually a little confusing; you could use the coins you collected to buy additional characters, but once you started playing around, there really wasn't much you could DO other than move. 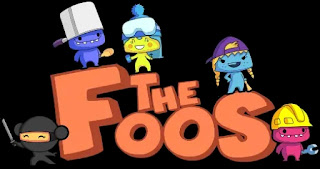 Overall, it seems that The Foos is a nice, little distraction that introduces the younger set to the world of "if-then". Considering that it's free and is available on every platform (it's built in Unity), it's definitely worth letting your little ones check it out. Just keep in mind that it won't last long.